Sebastian's greatest adventure / George Dreyfus. Sebastian the Fox (1963) was an ABC TV series for children made by renowned Australian film-maker Tim Burstall who went on to direct many other films including Alvin Purple. The original 13 episodes tell stories of the outlandish adventures of Sebastian, a marionette fox operated by the legendary Peter Scriven. Tim Burstall asked composer George Dreyfus to write the music for the entire series. Dreyfus produced a delightfully quirky, neo-classical soundtrack, as well as the catchy opening theme song. This was ten years before his rise to fame with his beloved Theme from Rush. Now, nearly 50 years later, four episodes of the classic series have been restored - transferred from original negatives. The music has been newly recorded by the Staatskapelle Berlin conducted by Jonathan Dreyfus. It looks and sounds better than it ever did! A bonus 45 minute documentary includes interviews with some of the people involved with the original television series. All in all, a fascinating look at an important chapter in the re-birth of the Australia film industry in the latter part of the 20th century. This presentation is a must-see for lovers of Australian music, classic films and family fun. The DVD has 4 complete 10 minute episodes with newly recorded music in stereo - plus a bonus 45 minute documentary - plus 3 extra episodes with original soundtracks (including one starring Barry Humphries) - plus a bonus CD of the new stereo soundtrack music. Score: The adventures of Sebastian the fox / composed by George Dreyfus ; arranged for piano by May Clifford. Score & Part: The adventures of Sebastian the Fox : arr. for bassoon and piano / George Dreyfus. 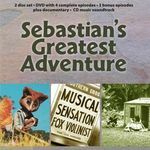 Score: The adventures of Sebastian the Fox / George Dreyfus. Score & Part: The adventures of Sebastian the Fox : for violin and piano / by George Dreyfus ; arranged for violin and piano by Josette Morgan. Score: The adventures of Sebastian the Fox : arranged for school orchestra / George Dreyfus.